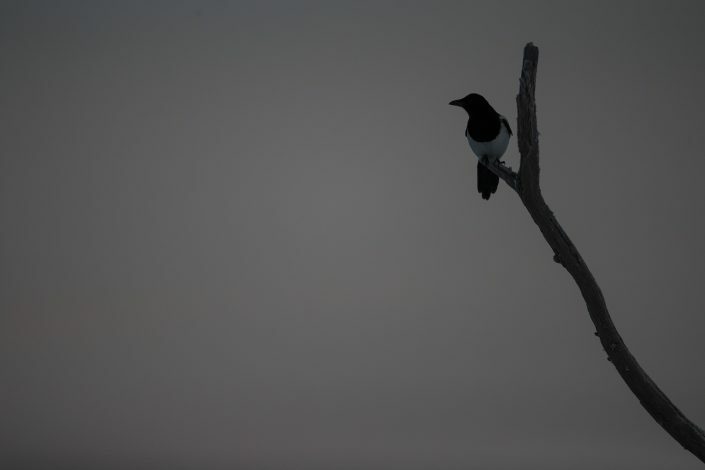 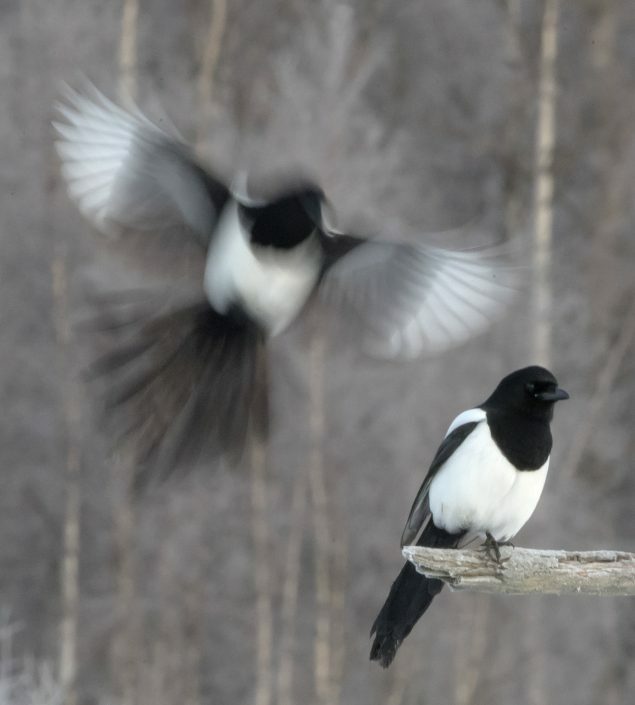 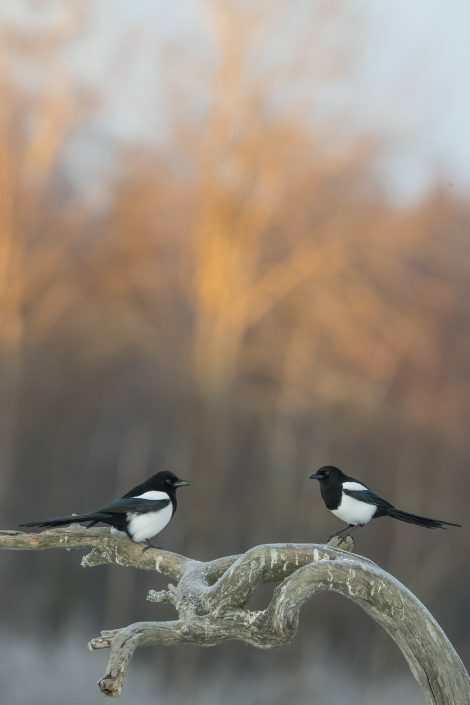 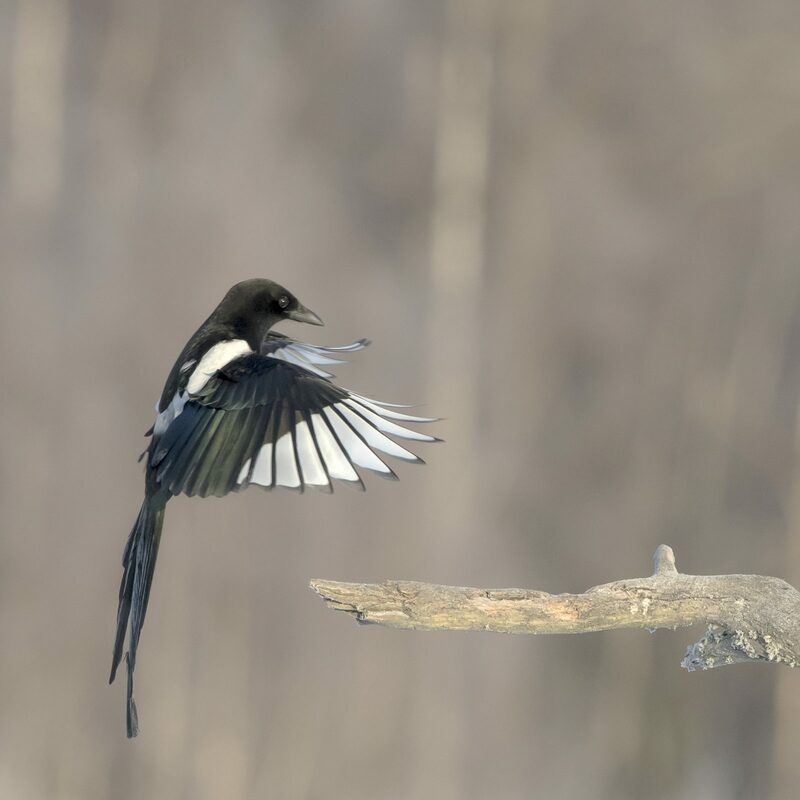 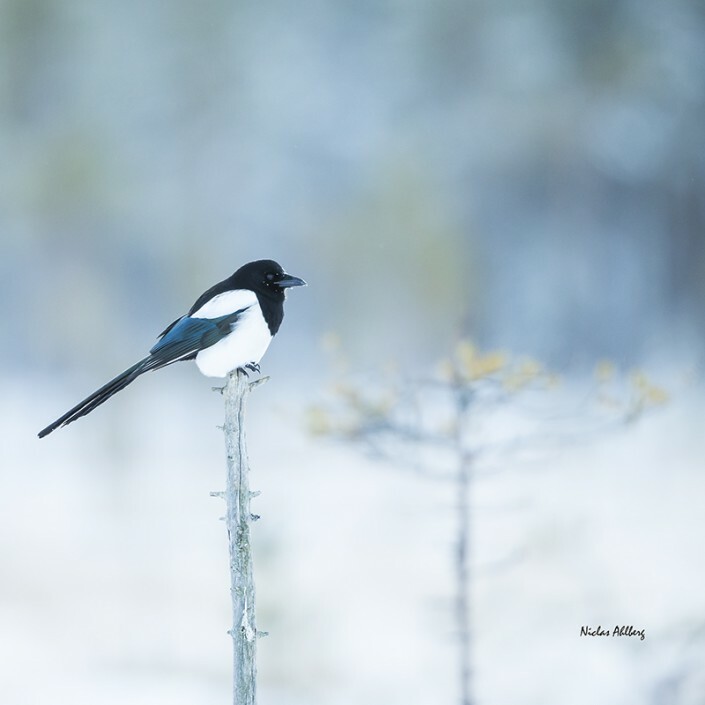 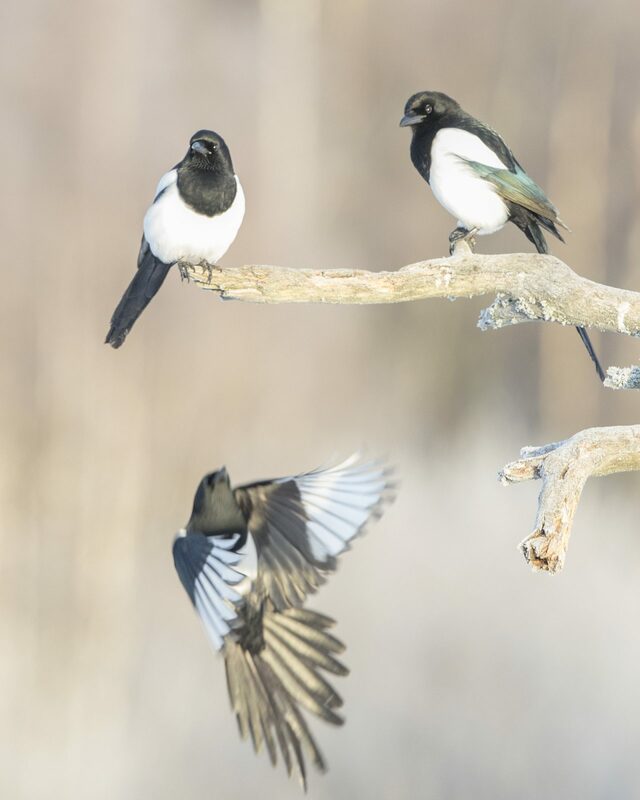 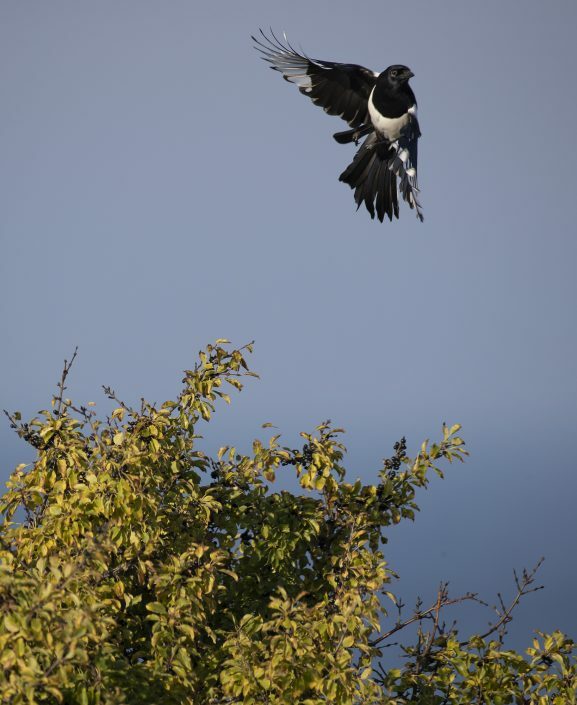 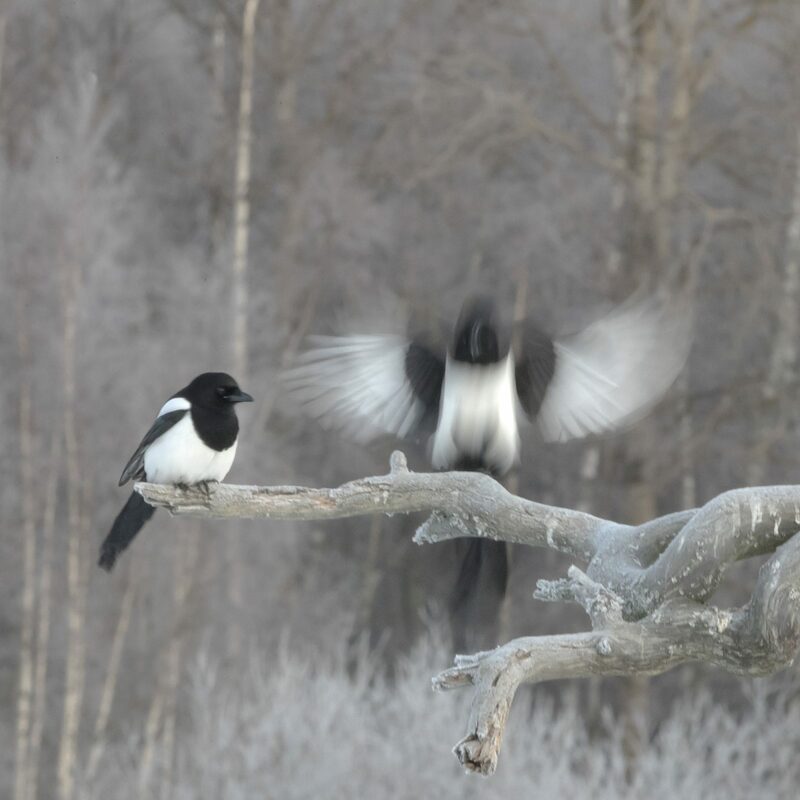 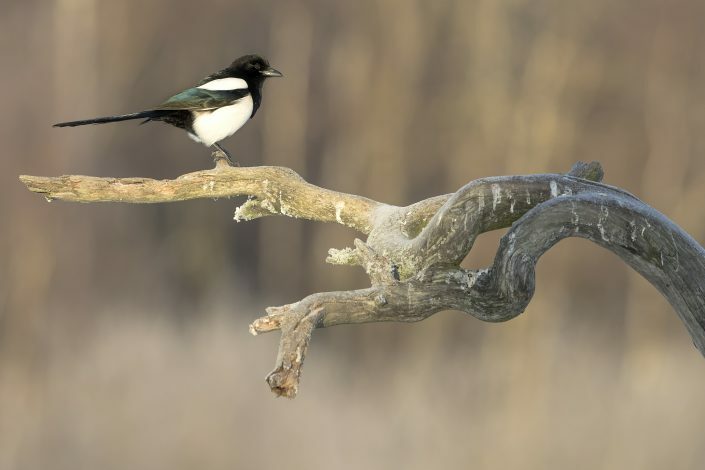 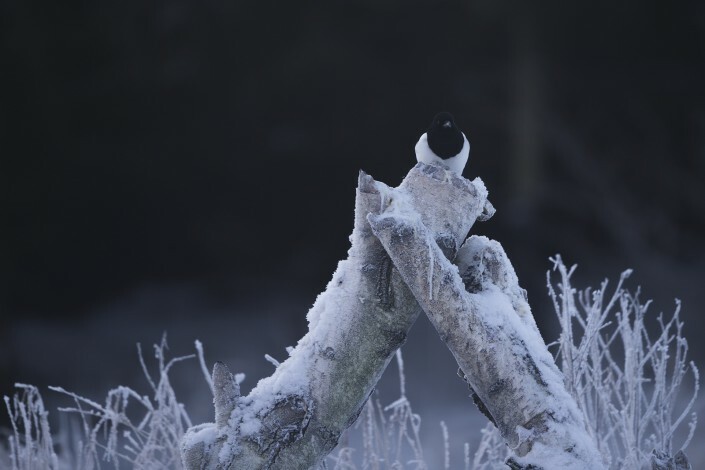 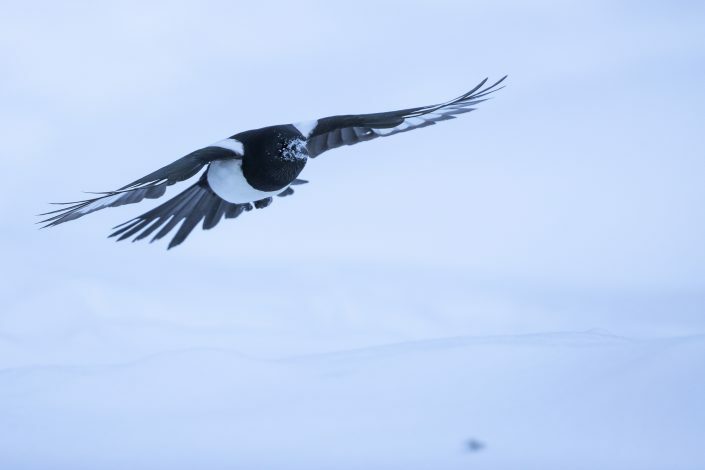 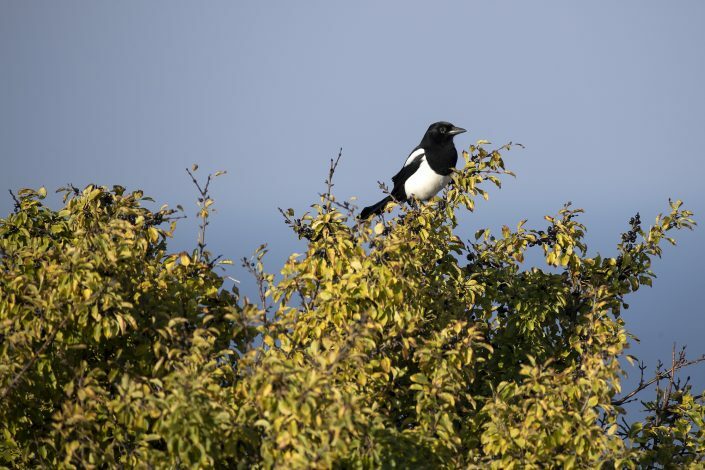 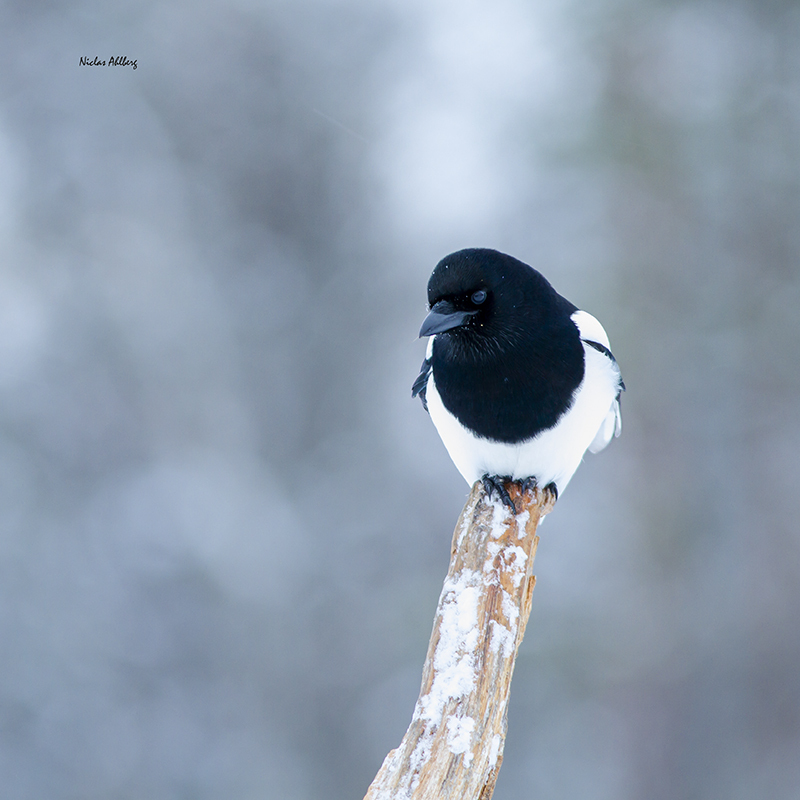 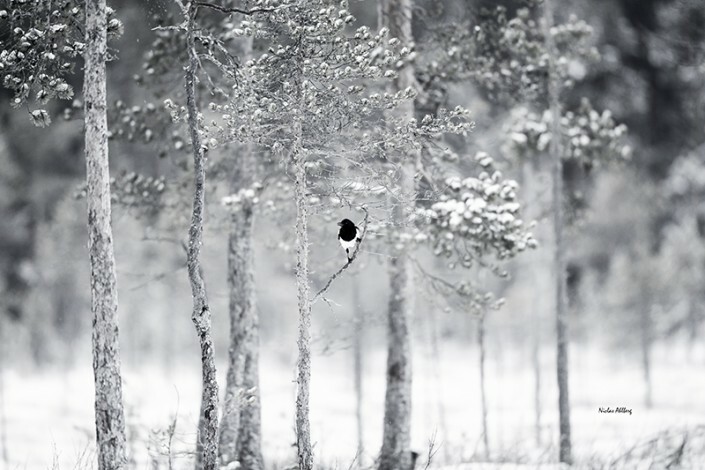 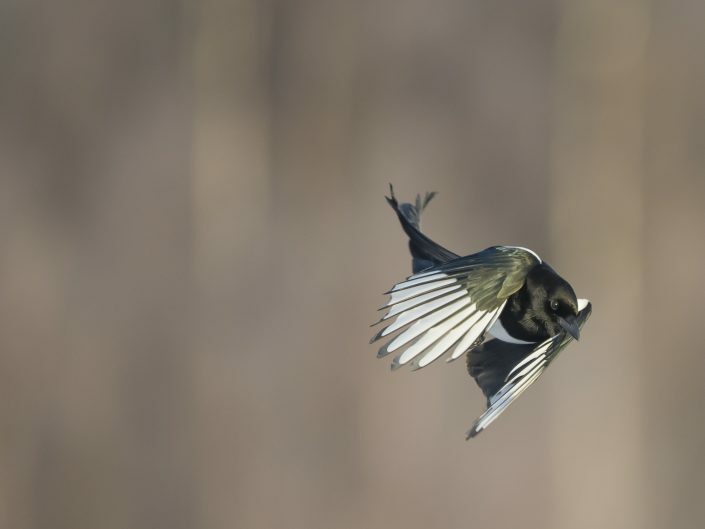 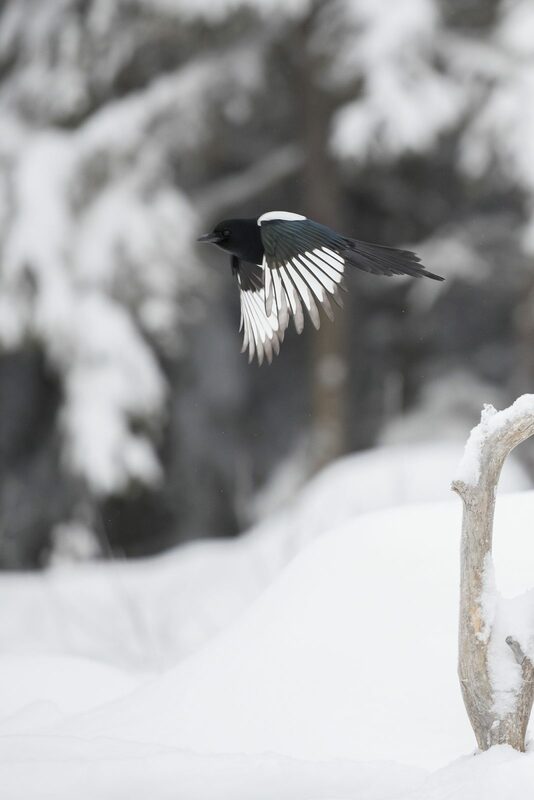 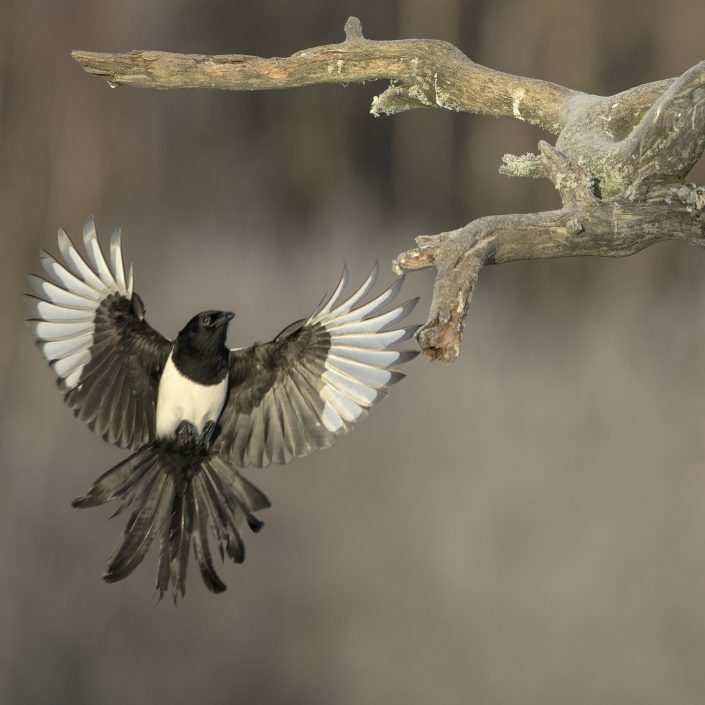 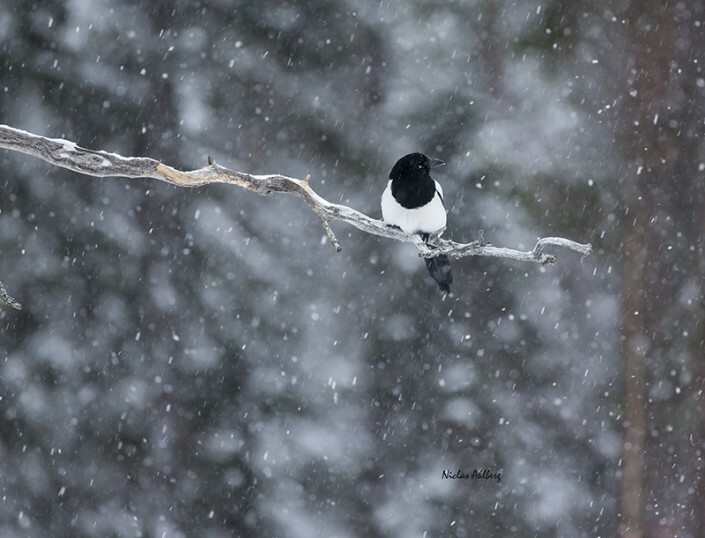 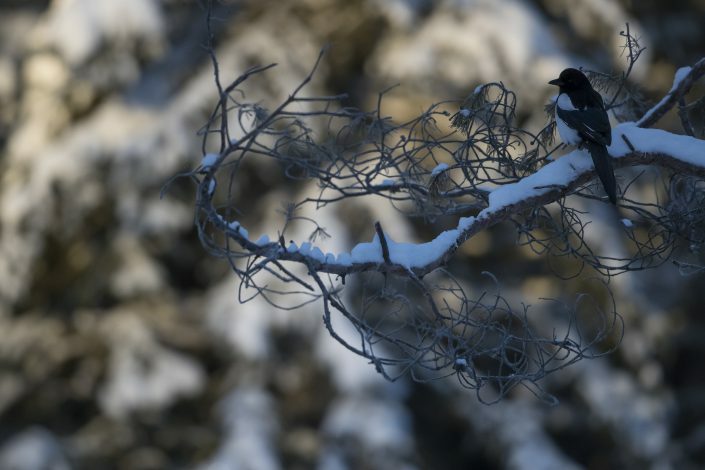 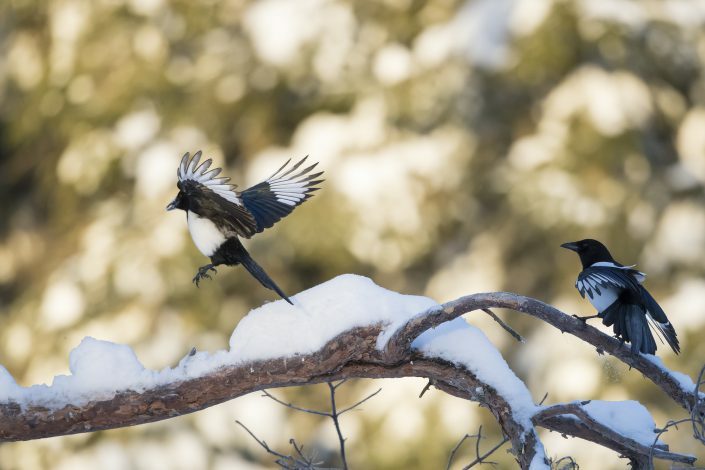 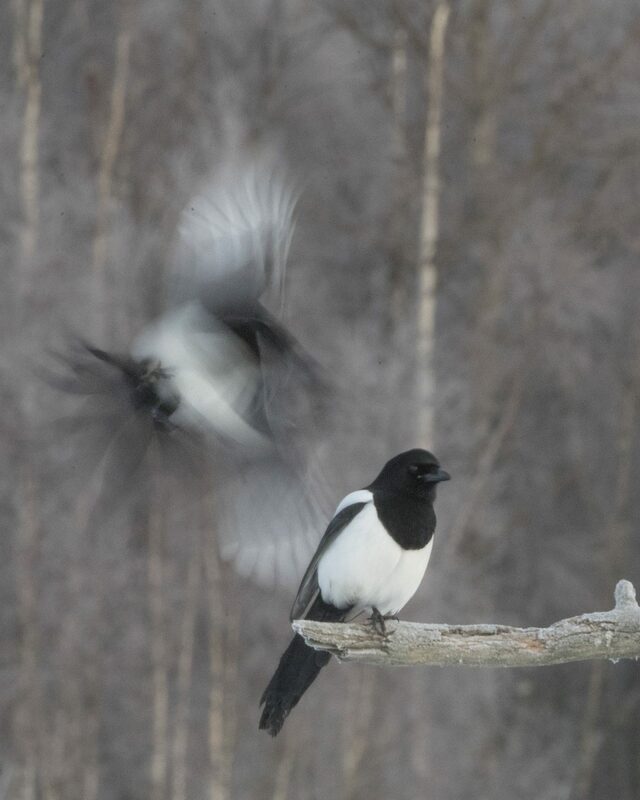 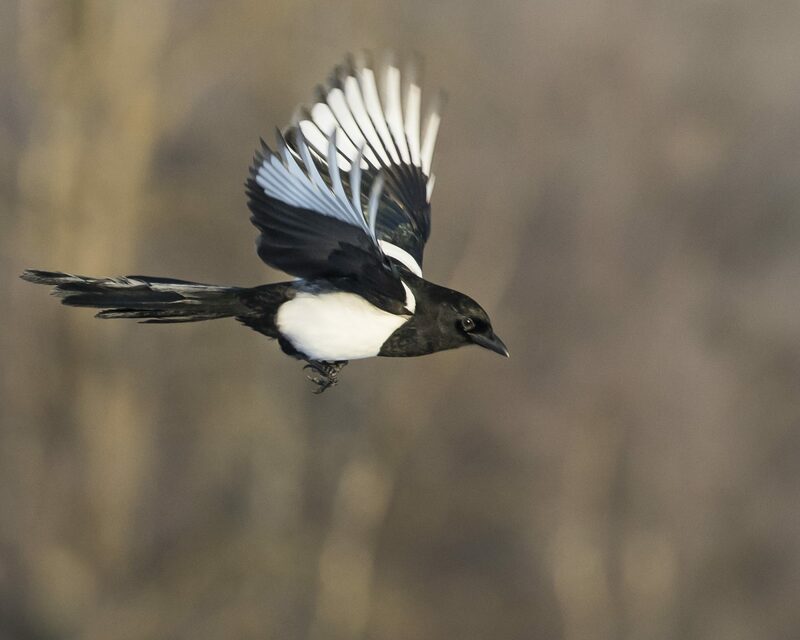 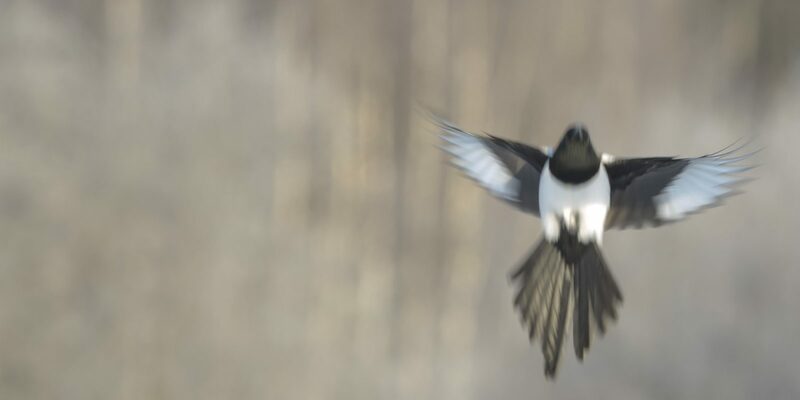 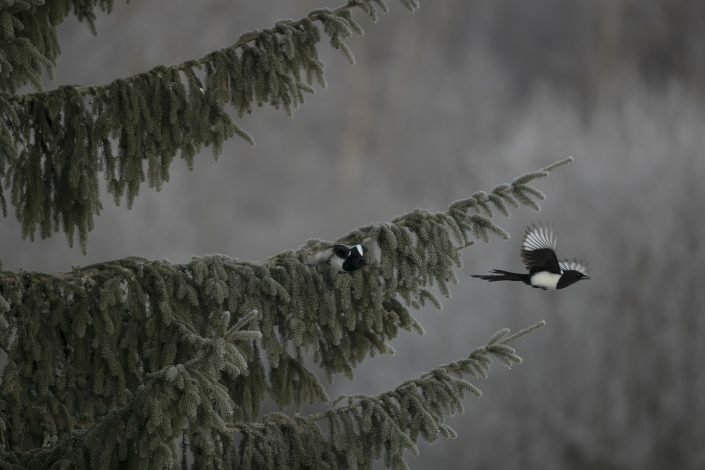 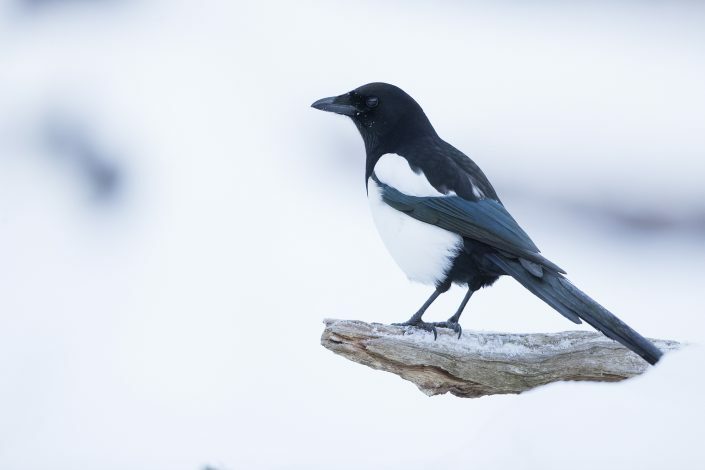 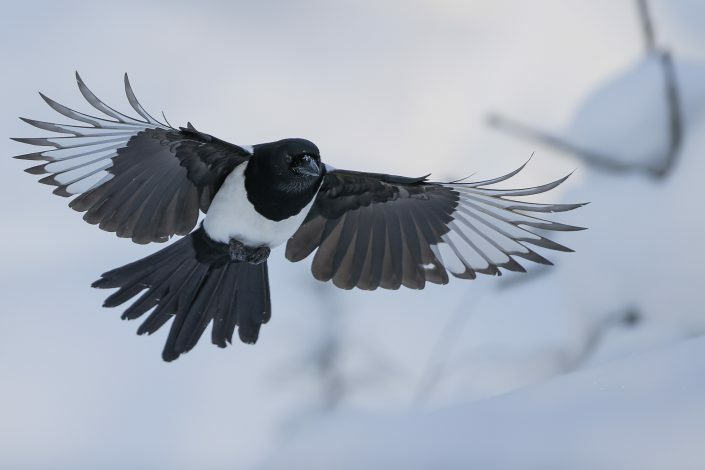 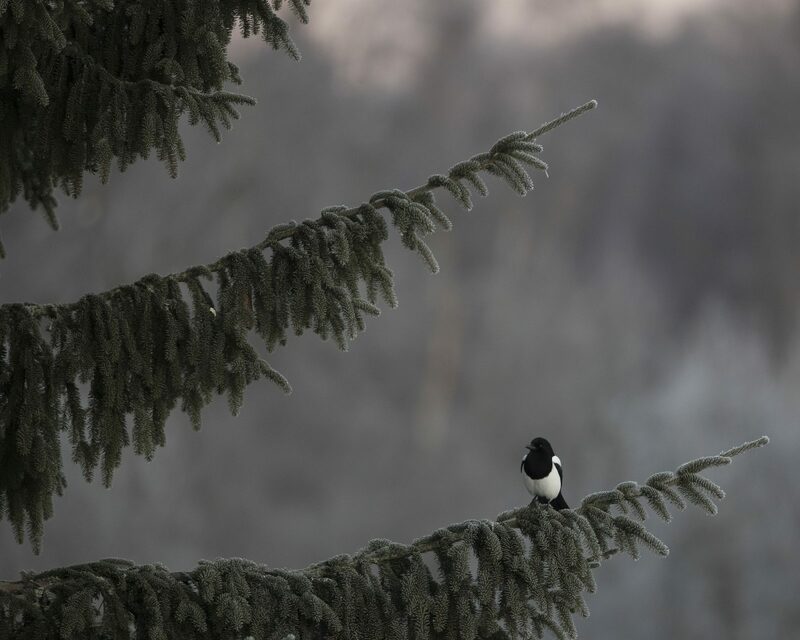 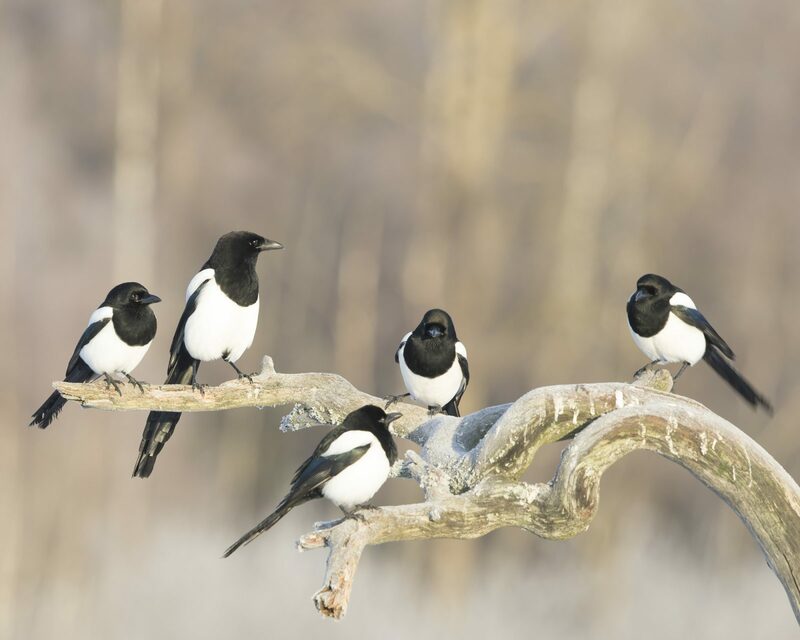 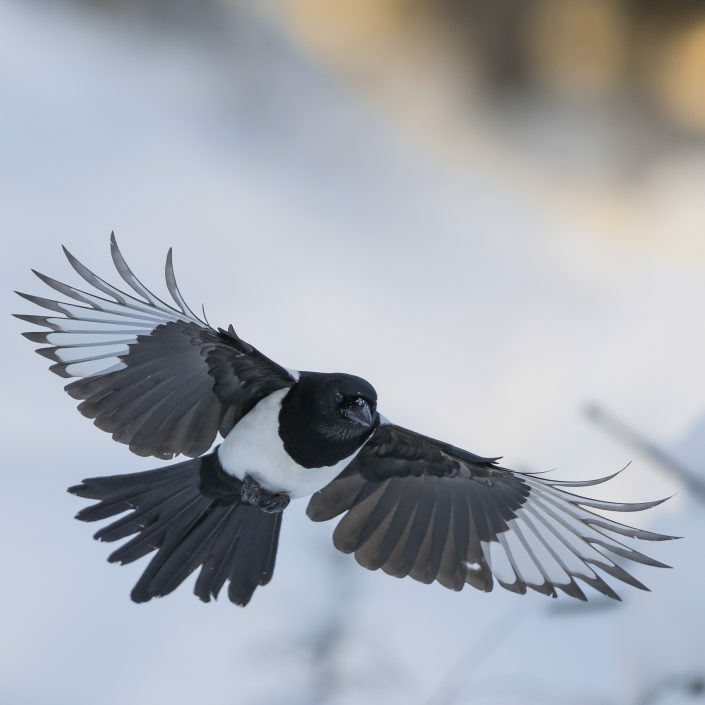 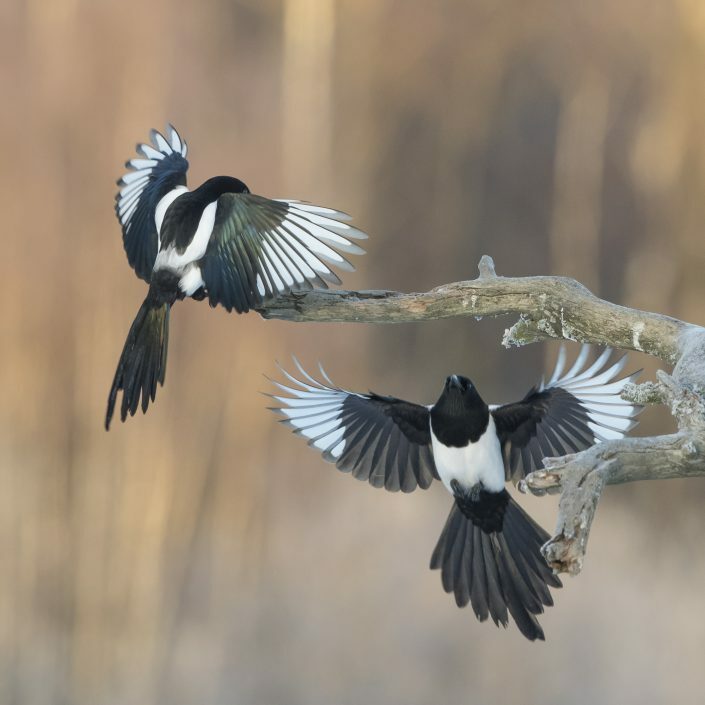 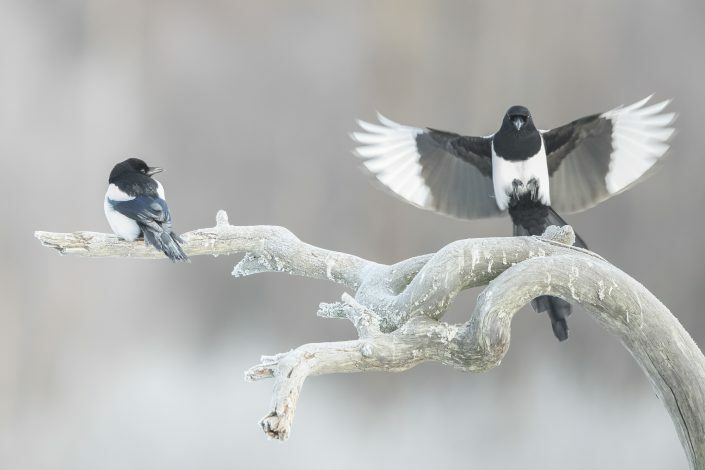 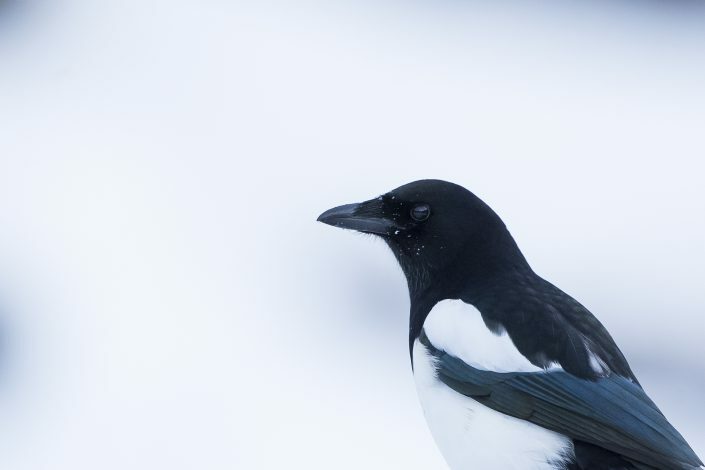 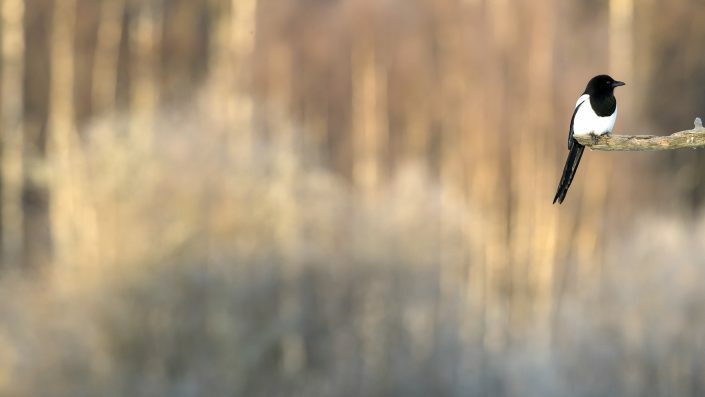 are birds of the Corvidae (crow) family, including the black and white Eurasian magpie. They are often seen around cities and they eat both vegeterian and animalic food. 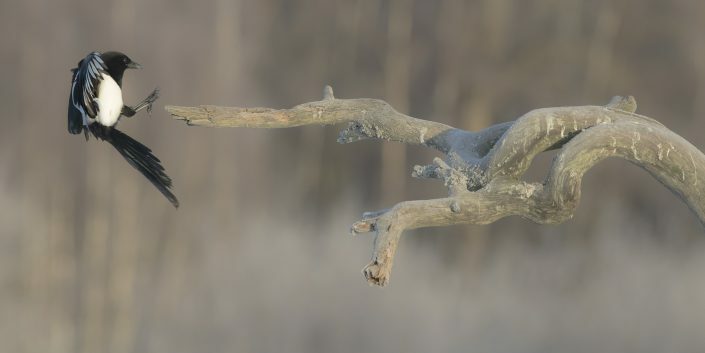 It is considered to be one of the most intelligent animals in the world, and the only non-mammal species able to recognize itself in a mirror test. 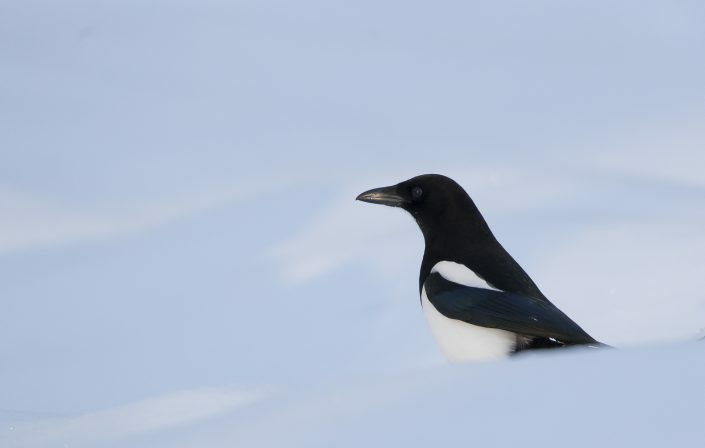 The adult male of the nominate subspecies, P. p. pica, is 44–46 cm (17–18 in) in length, of which more than half is the tail. 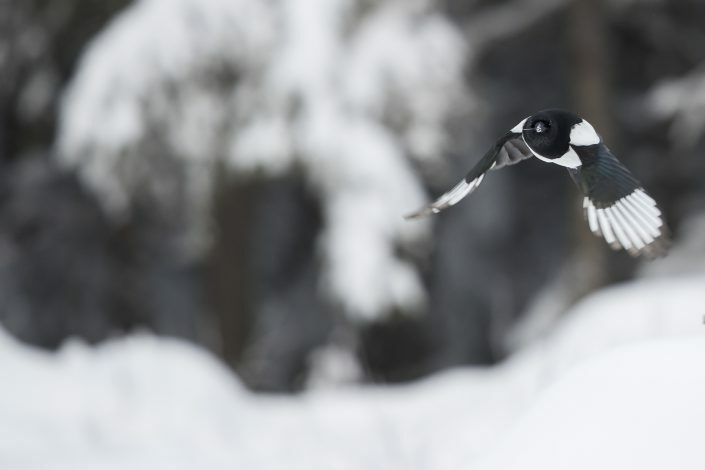 The wingspan is 52–62 cm (20–24 in). The head, neck and breast are glossy black with a metallic green and violet sheen; the belly and scapulars (shoulder feathers) are pure white; the wings are black glossed with green or purple, and the primaries have white inner webs, conspicuous when the wing is open. 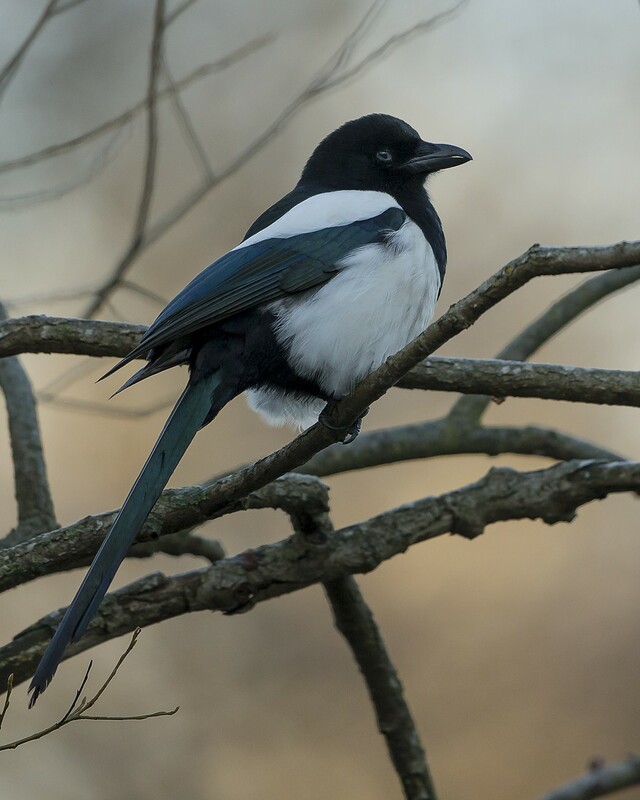 The graduated tail is black, glossed with green and reddish purple. 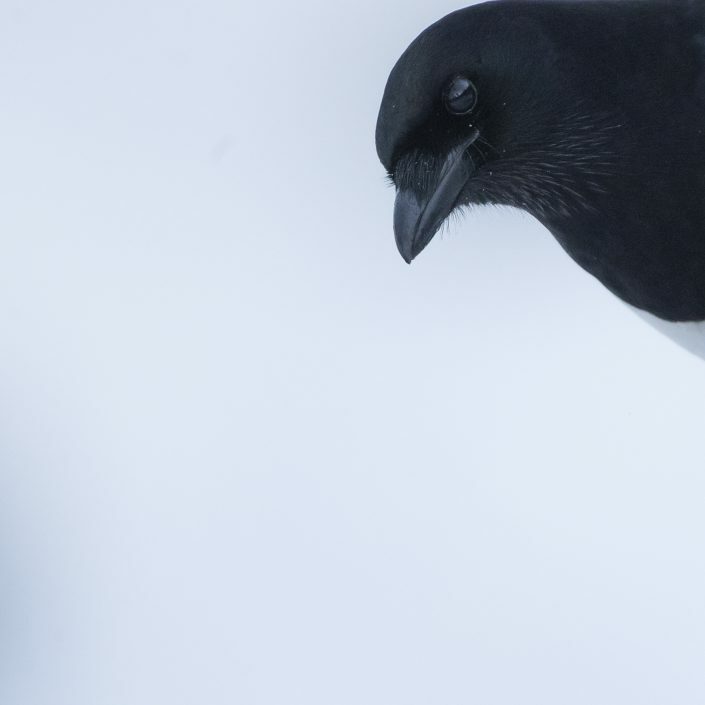 The legs and bill are black; the iris is dark brown. 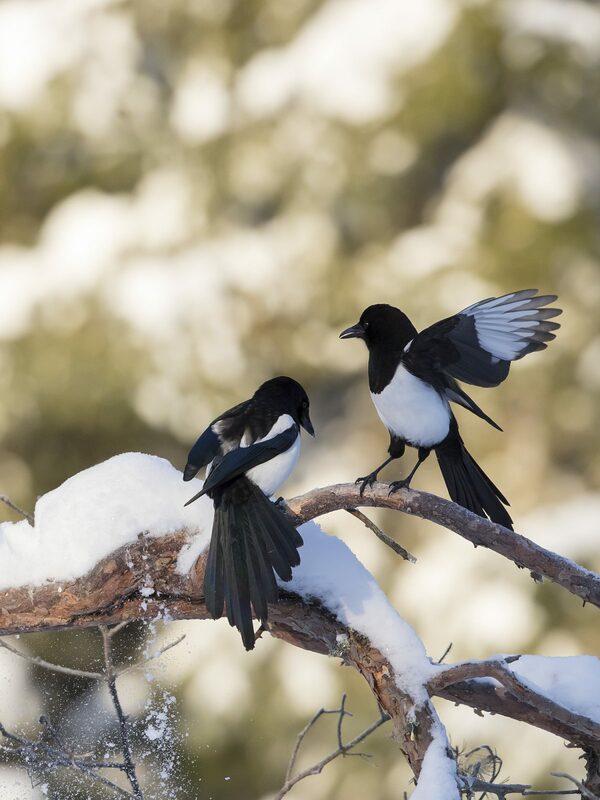 The plumage of the sexes is similar but females are slightly smaller. Males of the nominate subspecies weigh 210–272 g (7.4–9.6 oz) while females weigh 182–214 g (6.4–7.5 oz). 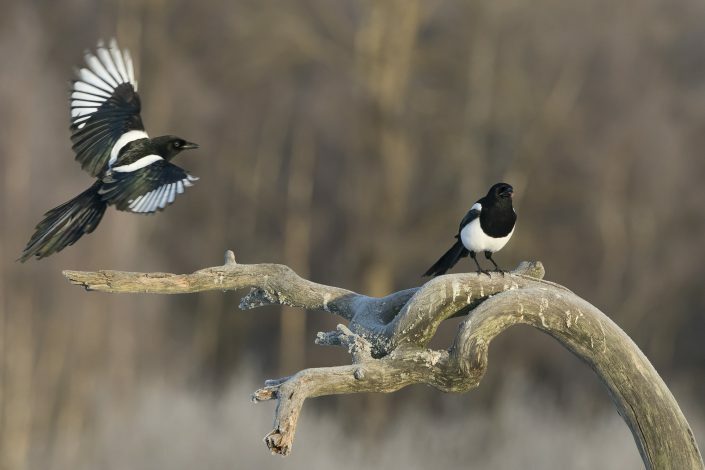 The young resemble the adults, but are at first without much of the gloss on the sooty plumage. The subspecies differ in their size, the amount of white on their plumage and the colour of the gloss on their black feathers. 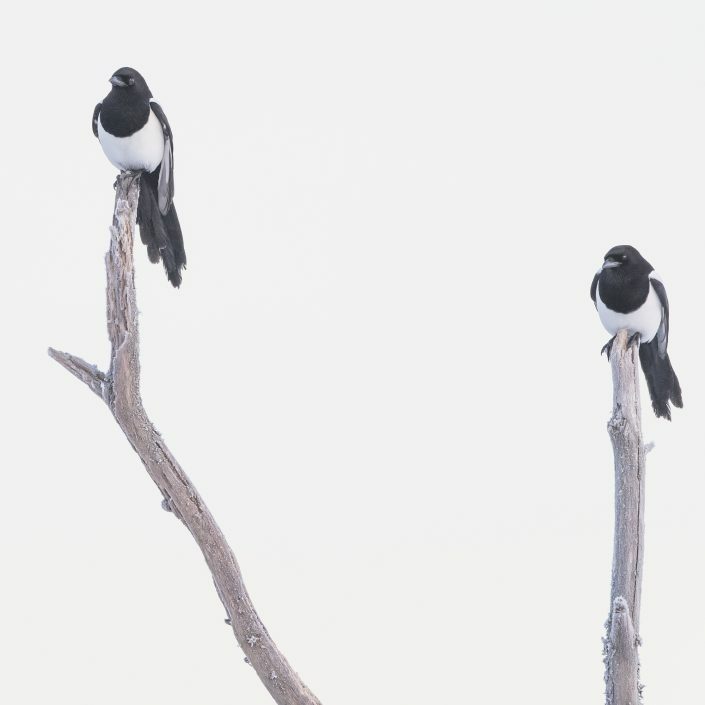 The northwest African race P. p. mauritanica differs from the nominate subspecies in having a patch of blue bare skin behind the eye, no white patch on the rump, and a longer tail. 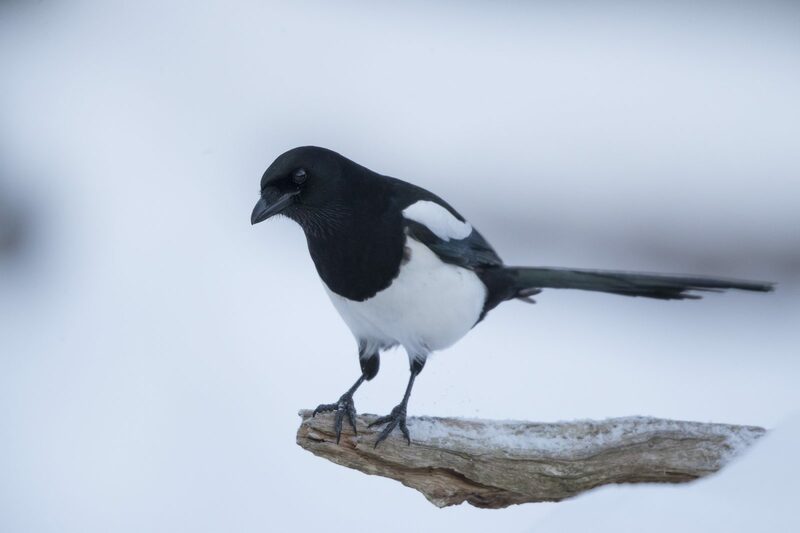 The southwest Arabian race P. p. asirensis differs in having more black in the plumage with a narrower white scapular patch, no white rump, and smaller white areas on the primaries. The Asian race P. p. bactriana has more extensive white on the primaries and a prominent white rump.